Who better to give book recommendations than the bookish experts? Penguin Random House employees are sharing their favorite reads every month. Browse below! Leigh Marchant is SVP, Director of Marketing and Business Development at Random House. Who better to give book recommendations than the bookish experts? Penguin Random House employees are sharing their favorite reads every month. Browse below! Elda, Penguin Publishing Group Elda Rotor is Vice President and Publisher of Penguin Classics. Who better to give book recommendations than the bookish experts? Penguin Random House employees are sharing their favorite reads every month. Browse below! Haley, Consumer Marketing Haley is a marketer with the heart of a nerd, writing and running the social media accounts for Unbound Worlds, Penguin Random House’s sci-fi and fantasy site. When not at work, she’s off traipsing through imaginary worlds and trying to find room for her ever-growing book collection. Who better to give book recommendations than the bookish experts? Penguin Random House employees are sharing their favorite reads every month. Browse below! Jenny, Production Manager, Crown Publishing Jenny, a production manager at Crown, is convinced she was born with a book in her hand. She lives in her houseplant forest/apartment and spends all her free time drinking tea and rearranging books. Who better to give book recommendations than the bookish experts? 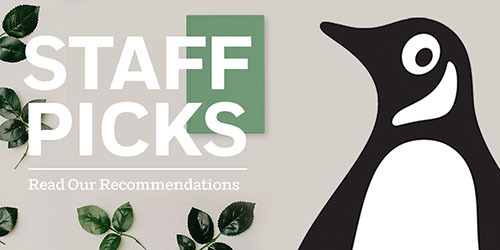 Penguin Random House employees are sharing their favorite reads every month. Browse below! Megan, Assistant Editor, Audio Megan is the friend who’s reading a book when you show up to dinner and recommends no less than six others over the course of your meal. If you can’t find her in a book or at a restaurant, she’s likely listening to a podcast on her commute or up in the air en route to her next trip. Megan is also a member of Read Ahead’s Junior Board and has been a volunteer for four years. 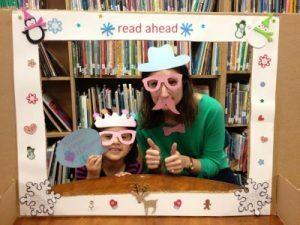 Read Ahead is a charitable organization that matches mentors with children to foster a love for reading and promotes literacy. Read below for Megan’s interview about her volunteer work! 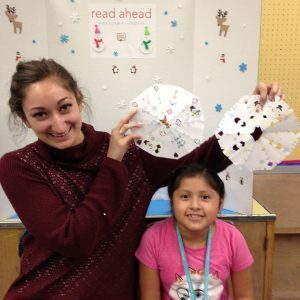 RA: What is the most rewarding part of volunteering with Read Ahead? MM: The most rewarding part of my experiences volunteering have been with my student, Yetzibeth. She brings so much excitement and enthusiasm to every kind of book that we read together. We’ve read books that range from Barbie princesses to non-fiction books about bees. It’s incredible to see her excitement grow with each session – she is just so imaginative. When we start to get into a book she really likes, she can’t wait to turn the page and see what’s next. I learn as much, if not more, from her than she does from me. RA: How has your relationship with her grown? MM: We understand each other more as we continue to get to know each other. We aren’t just reading together the whole time. When we first started she would come in and we would sit down and read together, but as we’ve gotten to know each other we’ve become a lot more comfortable, spending more time talking and learning about each other. RA: Is there a book you’ve read together that has been particularly successful? MM: She has such a range of interests – we’re always reading about something new. One book that she really loved was “The Day The Crayons Quit” by Drew Daywalt – it really is a great story and she was so excited by it. Who better to give book recommendations than the bookish experts? Penguin Random House employees are sharing their favorite reads every month. Browse below! Casey Blue, Senior Manager, Business Development Casey Blue is a proud nerd who loves doling out book recommendations as much as she loves reading. When she’s not doing one of those things, she’s either running, cooking, on the beach, or in a museum.